Is there any image more full of possibility than a window? A window can serve as a frame for a picture, organizing the space and directing our eye. We can look out from the window onto the world; the world as we see it, or the world of our imagination. Or we can look in at a window and catch a glimpse of somebody else’s life, which can leave us feeling lonely and on the outside, or can be welcoming and inviting. In the reflection of a window we can find ourselves, or catch a glimpse of everything sneaking up behind us. An open window suggests infinite promise, letting light and air pass through, making patterns of sunshine and shadow. A closed window hides something, mysterious or off-putting. Photographer Robert Goodman likes to freeze a moment in time and share it with the viewer, letting us see what he sees. Whether in his own neighborhood or halfway across the world, his photographs show us qualities that we all share. 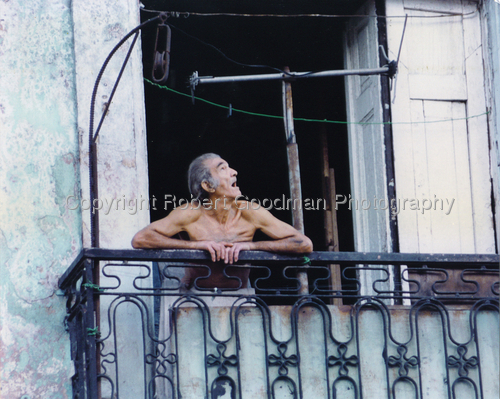 In Havana Man in Window, we see the familiar sight of a man in a window, beautifully framed in the dark shadows of his home behind him. A jumble of wires and clothesline, mundane and off-kilter, contrasts with the more solid and formal structure of shutters and railings. He’s looking up to the sky, but we don’t know what he sees. 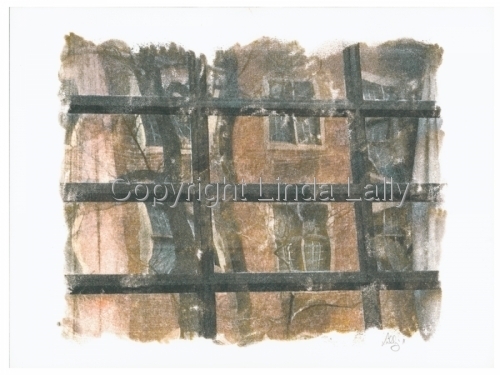 Linda Lally deconstructs images to form new meaning. She uses digital photos, which she prints and uses as a painting medium through a photo transfer process, to create dream-like, unexpected landscapes, joining images in a new context. In City Window, she leaves out the frame of the window altogether, which gives the picture a lost, loose, ungrounded appearance. We see windows across the street, through the bars of our window, and the whole picture creates an atmosphere of urban suspicion and solitude. Ethel Hills creates an abstract landscape in Window on the World that plays on our expectations of the structure of a window to open limitless possibilities. She works with pattern and movement to create simple and intimate compositions, and captures the memory of a place to make a landscape of emotion. The window could be any window, but we make meaning out of color and line and shape to construct the memory of a specific window, in a certain place, at a certain time of day and time of year. It’s vibrant and green, full of hope and life. Nothing feels quite as desolate as an unkempt window with broken panes, falling in on itself. 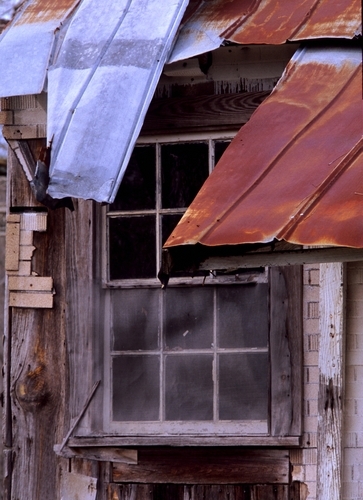 The danger of broken wood and wire and glass adds drama to the atmosphere of abandonment. Larry Fuchs’ Tuskegee Window, rusted and splintered, suggests years of neglect, and yet there is a raw beauty in the overlapping shapes and colors. 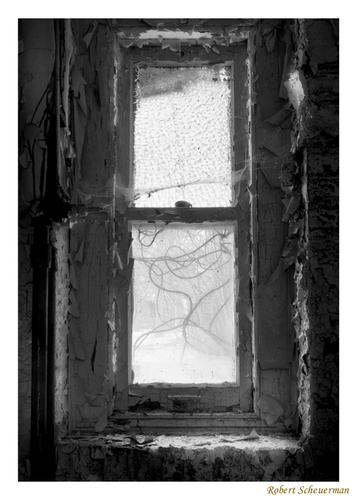 Robert Scheuerman’s Derelict Window, in black and white, is complex and haunting. A tangle of wires, rotting wood and peeling paint echoes vines that grow outside the window, visible through the clouded glass, although the vines suggest life and hope. 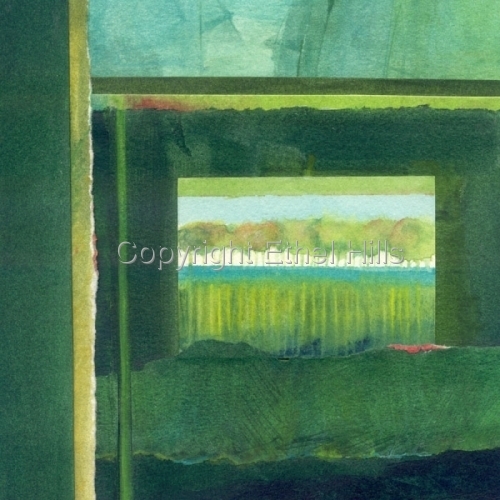 D. Marsh’s painting Train Window #1 captures the giddy feeling evoked when the interior and exterior worlds travel at different speeds, in a rush of movement and color. We’re sitting still, but we’re engrossed in the world that we pass, which seems alive and alight. 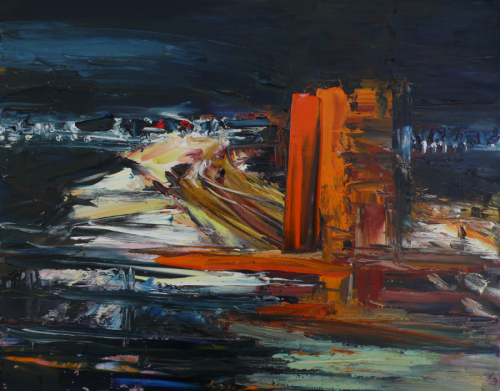 The painting is nearly abstract, but we recognize the rails of a bridge, the suggestion of a city in the background, and the moodiness of an urban night. The painting is full of mystery and questions, captured in bold strokes and strong colors. 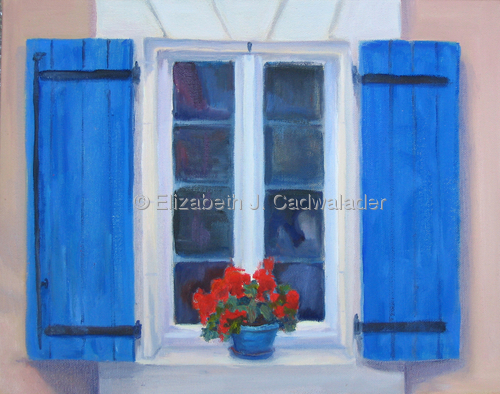 When she paints, Elizabeth Cadwalader transforms a blank canvas into a miniature world, and in Provence Window she provides a beautiful little stage for the action of her world to unfold upon. The original window is located in the “colorful town of Roussillon, France, where ochre is quarried,” and we get a hint of the brightness of the town in the bright blue shutters and bright red flowers. The painting is full of sunshine and light, and we feel we are waiting for somebody to open the window and let in the summer breeze. Whether open or closed, well-kept or derelict, windows speak to us. They help to focus our attention on the world within a work of art, and they suggest the mystery and promise of lives created by others.